UJ’ s post notwithstanding, every red-blooded American cares about the real March Madness — not some ever-present Social Security funding issues. Social Security problems will be around forever. The NCAA Tournament, on the other hand, is a one-and-done thing where you live for the moment. What could better epitomize modern America? We are glad that the Ohio State Buckeyes, which won another Big Ten Tournament championship, are the overall number one seed. It looks like the Buckeyes fared well in the brackets, and it looks like the Big Ten did well, too. We’ll watch to see who wins the play-in game to face the Buckeyes, and we will watch the NCAAs with great anticipation. We want to see the upsets, the underdogs, the last-second buzzer beaters, and the Cinderella teams. It is a heck of a lot more entertaining, and uplifting, than thinking about Social Security funding. Nope I am not talking about your typical March Madness, the NCAA basketball tourney. March for me represents the month that I receive my annual social security statement. Anymore I often wonder if it is worth the paper it is printed on. The first page of the document always talks about Social Security’s future and every year it says action is needed soon to make sure the system will be sound when today’s younger workers are ready for retirement, but in reality another year has come and gone with our politicians in Washington having done nothing about it. Last year the document said that in 2016 the government will begin paying out more in benefits than they collect in taxes, this year that date has now been revised to show 2015. The statement also says that without changes the trust fund will be exhausted by 2036 as to 2037 mentioned last year. I’m frankly not surprised by these revisions at all. I was at a party recently where all of my friends are 60+ and every single one of them is planning on drawing on social security at age 62 for one reason or another. Either it is because of the stock market being flat for the past ten years leaving a lot less in their 401k accounts then they expected. Or they were the victim of a downsizing and they had to take work at a much lower salary. Or because they now have medical issues and they need the money to pay the higher deductibles, co-pays and out of pockets that their employers are asking them to pay, not to mention the expense of prescription drugs. Some just plain say I want to get something out of the program and they don’t know if it is worth waiting til full retirement age to do so because they may get a lot less. It’s a tough decision because if you start drawing at age 62 as opposed to your normal retirement age your payments are 30% less than they would be if you wait. If I wait to age seventy I can collect a tidy sum of $33,324 annually, but I may get nothing at all – – – – oh the madness ! 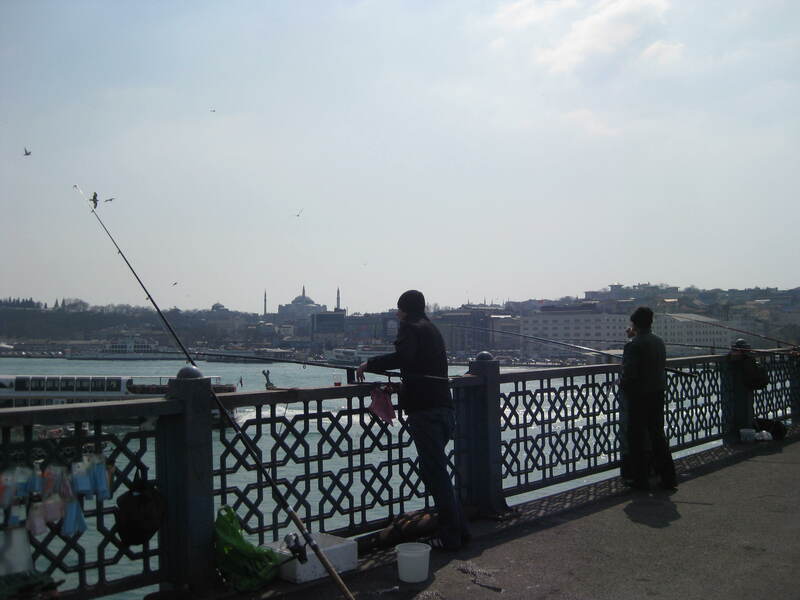 Fishermen on a bridge over the Bosphorus. On Monday the 7th I arrived in Istanbul, the first destination of the four-and-a-half-month European backpacking trip I’d been planning for the better part of a year. I was exhausted, having slept for only a few ten-minute stretches on the flights from Columbus to Detroit to Amsterdam to Istanbul, but not so much to prevent me from being excited to start my trip. I took a train from the airport to Sultanahmet, Istanbul’s historical city center, where my hostel, the Best Island Hostel, was located. I had reserved a bed there on hostelworld.com because it was the cheapest hostel in Istanbul that had decent reviews. When I checked in, the receptionist told me that they couldn’t put me in the six-person dorm room I had reservations for because a group had taken it. But, she said, they had a bed available in a sixteen-person room and were willing to reduce the price. We negotiated a new price of 100 Turkish lira ($63) for my week-long stay, down from 120 lira. Although I was annoyed that they reneged on my reservation, I was so tired and so glad to finally be at the hostel that I didn’t care much. Plus, I was happy to save a little money. Despite the bad start, I enjoyed my stay at Best Island Hostel, and I would recommend it to those willing to put up with lots of inconveniences to experience Istanbul on the cheap. The best part of the hostel was the people I met there. Indeed, after the unfortunate incident with my reservation, a Georgian woman who works there rolled a cigarette for me, free of charge, and gave me a free beer. After getting settled, I befriended two American girls in my room who had just spent a year teaching English in Thailand. They were looking for teaching jobs in Istanbul because they didn’t like Thailand, in large part because the Western men there didn’t show them much attention due to the hordes of admiring Thai girls available. This led to many conversations ın whıch I defended the nature of men. They found a job and an apartment on my third day there. I usually ate breakfast with a middle-aged Tunisian man who was staying at the hostel while he visited a friend in town. He was happy with the results of the uprising there, which he did not see coming. We agreed that any form of American intervention in Libya would be a bad idea. He told me a lot about his experience growing up in Tunisia, his travels, and his Muslim faith. Also in my room was a French couple and their three toddlers, who were in the middle of a biking trip from Switzerland to Vietnam. They were probably the most multicultural family I’ve met – the father was half-German, half-Malaysian, and the mother was half-Madagascaran, half-French, if I recall correctly. I was a little pissed when I saw that three toddlers were stayıng in my room, but they were pretty well-behaved, and they made up for any misbehavior by adding some life to the room. When the family left halfway through my stay, the hostel felt uncomfortably quiet. The view of the Hagia Sofia from the hostel's balcony. Other than the people, the best part of the hostel was the location. It is within a short walk of most of Istanbul’s most famous historical sights, which may be why the street it’s on seems to be Istanbul’s Cheap Hostel District. 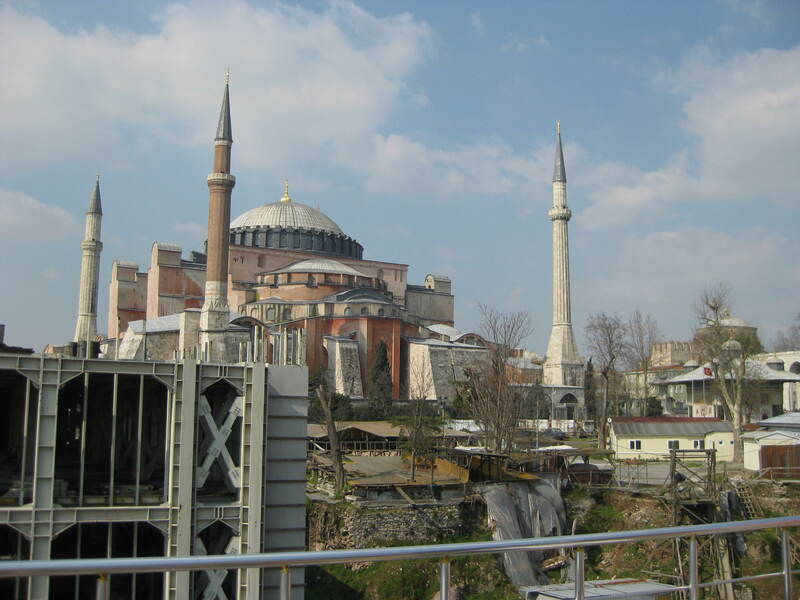 There is a terrace on the top floor that faces the Hagia Sophia, which is about a block away. When I stepped onto the terrace soon after arriving, I immediately wondered why some millionaire doesn’t buy the building and turn it into his house, since it has a breathtaking view of one of the greatest buildings in the world. Nothing else about the hostel was particularly pleasant. Every morning, they provided a breakfast that I would rate as Acceptable. It consisted of two slices of cucumber, two half-slices of tomato, a thin square of cheese, a hard-boiled egg, a little container of butter, a little container of jelly, an unlimited supply of table bread, and an unlimited supply of tea. The bathrooms were Slightly Unacceptable, as I expected. The ratio of bathrooms to people in the hostel was about 1:12, so they were usually crowded (each bathroom had one shower). They weren’t quite dirty, but certainly not clean. The worst part about them was that the showerheads weren’t mounted on the walls, and there were no curtains around the bathtubs, which made taking a shower a challenge. My room in the Best Island hostel. It was difficult staying in a room with fifteen other people with fifteen unique sleeping schedules. I didn’t an uninterrupted night’s sleep my entire time there. This is unavoidable in a room with so many people in it, however; everyone was always considerate. Unfortunately, the room was below the hostel’s bar, and one night there was a party that went into the early hours of the morning, playing loud Euro dance pop that kept me awake. One of the reasons I decided to start my trip in Istanbul was to enjoy some relatively warm weather after a harsh winter in Ohio. Winter followed me there, however. The highs were in the mid-30s – almost twenty degrees lower than the 52-degree average high I was looking forward to. It was often snowing or raining sleet during this time, and it was windy, as it usually is when unseasonable weather comes around. I rather liked seeing Istanbul under such unusual conditions, but not so much that I wasn’t happy when it got warm and sunny later in the week, allowing me to enjoy a few days of gentle spring weather. Another one of the few remaining Roman structures is the Roman circus. All that remains of it are the two Egyptian obelisks that served as turning points for the chariot racers. Today, it is a public square, much like the former Roman circuses in Italy. Although it is a peaceful place to take a walk now, it was the location of one of the most violent events in Istanbul’s history: the Nika riots, a confrontation between the fans of two teams of chariot racers that turned into a political riot that nearly overthrew the Byzantine emperor Justinian. Despite that unfortunate event in his reign, Justinian was perhaps the most accomplished of the Byzantine emperors. He attempted to take back the former Western Roman Empire from the barbarians and almost did so before it was lost again. He also left his mark on Istanbul, building my two favorite historical sights there: the Hagia Sophia and the Basilica Cistern. The Hagia Sofia, or Aya Sofia as the Turks call it. The Hagia Sophia was the sight I was most excited to see in Istanbul, and I was not disappointed. Like the Parthenon in Athens, it dominates Istanbul’s skyline as a reminder of the city’s contribution to world heritage. I always felt a shock when I turned a corner and saw the foggy image of the massive building in the distance. Seeing snow resting on it gave me a strange feeling, somehow reminding me of the unfathomable amount of time the building has been there. 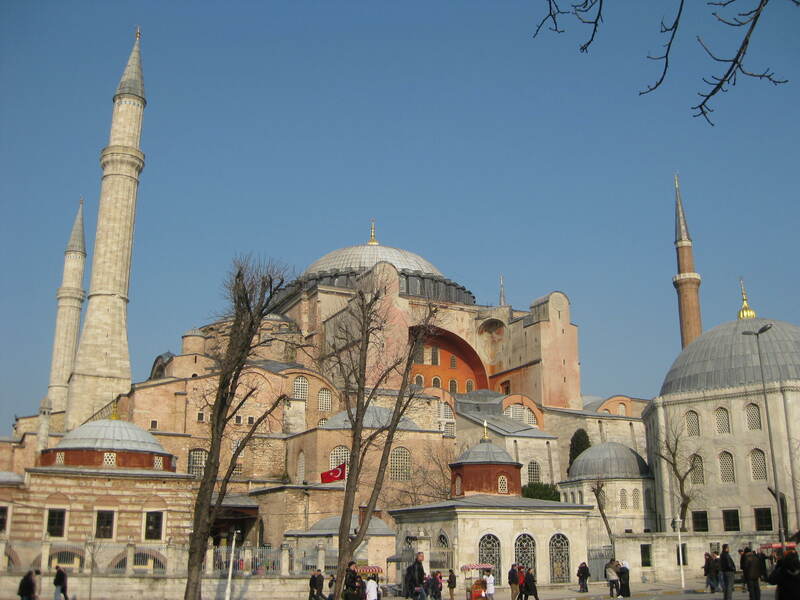 Justinian commissioned the Hagia Sophia as a Christian church in 532 A.D. after the church that was there before was burned down in the Nika riots. It was an ambitious architectural project, maybe too ambitious, because the original dome collapsed and had to be rebuilt. It was the principal church of the Byzantine empire and the site of Byzantine imperial ceremonies for almost a millenium, until Istanbul was taken over by the Ottomans, who converted it into a mosque. Since then, it has served as a model for mosques around the world. The interior of the Hagia Sophia is full of Byzantine mosaics that spent centuries plastered over after the building was converted into a mosque, before being uncovered in the 20th century. I like Byzantine art, although it is rigid and contains lots of obvious imperfections. The imperfections make it seem more earnest and charming than the realistic sculptures of the classical period. The art gives the impression that it was produced by a civilization in decline, which appeals to me in some way. 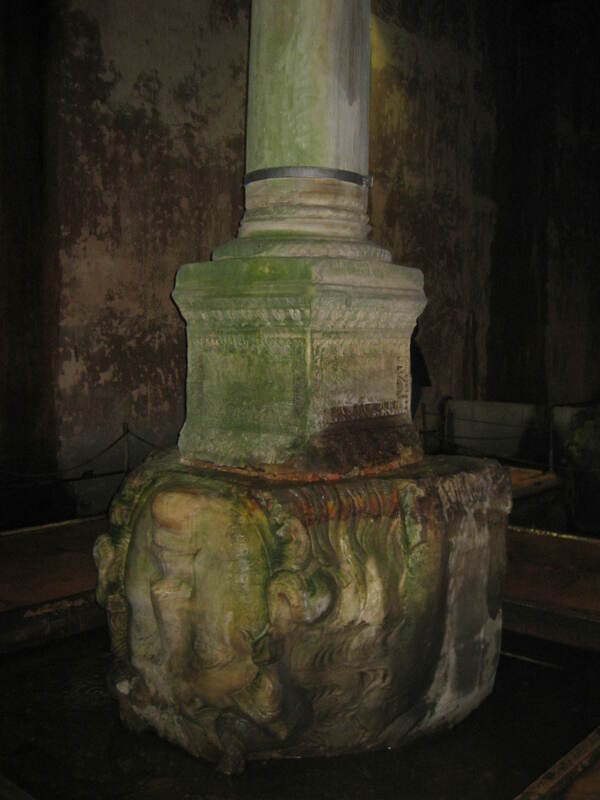 Medusa's head used as a column base in the Basilica Cistern. Almost directly under the Hagia Sophia is the Basilica Cistern, which was the location of a scene from From Russia with Love. The cistern was built by Justinian as a reservoir for the city, and it struck me as a last gasp of the brilliance of Roman engineering. Two of the pillars in the cistern rest on giant stone Medusa heads taken from defunct classical temples – an expression of the Christian Byzantine empire’s attitude towards its pagan heritage. 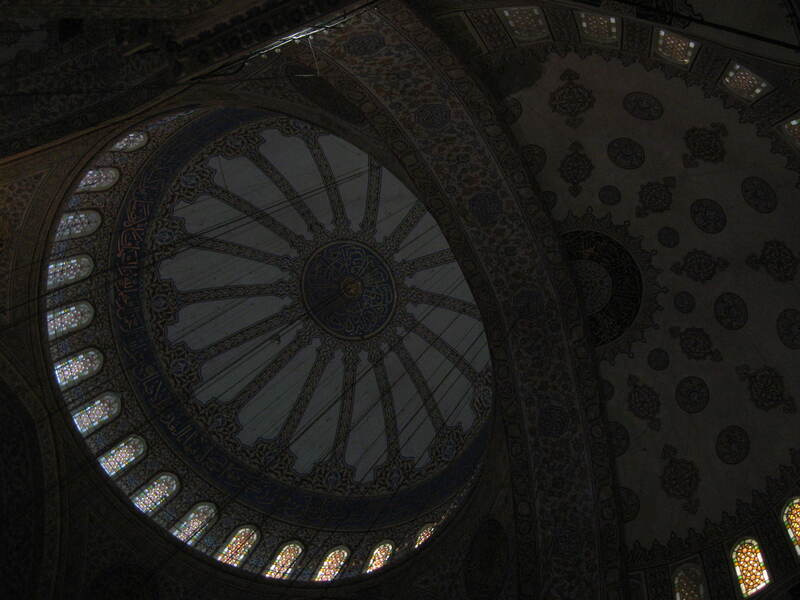 Some of the ornate decorations on the ceiling of the Blue Mosque. Sophia. The ınterior walls of the mosque are covered with intricate patterns that convey a sense of divine brilliance even to an infidel like me. The amount of work that must have gone into these flawless designs – especially those on the uppermost ceilings – show how devoted the society that created them was to its religion. Their mathematical precision expresses the complexity of God’s universe. I came out of the mosque with an appreciation for the beauty its builders saw in their religion. On the other side of the Bosphorus river from my neighborhood is the Galata district, where European foreign officials settled in the 19th century. As a result, the neighborhood features great European architecture with an Eastern tinge. I stumbled upon a mosque in the neighborhood that seemed to be in the Art Nouveau style. Despite the fact that Istanbul’s skyline is dominated by dozens of mosques, it does not have an Islamist culture. The first billboard ad I saw on the train from the airport was for lingerie, and the people dress stylishly in tight jeans and button-down shirts. The men put a lot of gel in their hair and the women seem to wear more makeup than in the U.S.A. I heard a lot of Western music – the only time I took a cab, the driver was playing 50 Cent, and I went to a bar where they were playing AC/DC and Metallica. Very few of the women wear headscarves, and when the call for prayer is announced (which woke me up when I first got here, but doesn’t anymore), it doesn’t affect the bustle of the street crowds. Turkey is a democracy that many see as a model for a new democratic Egypt. Indeed, the Turkish people seem happy and free, harboring none of the discontentment that has fueled the revolutions in other Muslim countries. I’ve noticed that there is a large police presence in Istanbul, however, with little police kiosks every few blocks occupied by surly-looking policemen. Outside of important buildings, policemen stand with their hands resting on the tops of their rifles. The film Midnight Express caused a furor here because of its portrayal of Turks as coldhearted weasels, and although I think that would be an incorrect portrayal of any people anywhere in the world, now that I’ve spent a week here I can firmly say that the Turkish people are completely unlike their representation in that movie. Every Turk I’ve met has been kind to me. I’ve been hassled very little, for an American tourist. As far as I can tell, I’ve even been getting fair prices everywhere. I will leave Istanbul tomorrow with nothing bad to say about the Turkish people, apart from their aggressive driving style. Yesterday I got an e-mail from William Mack Webner — known to me as Uncle Mack — announcing that he is officially retired from the practice of law. His decision to retire marks the end of more than 40 years of practicing as one of the premier intellectual property lawyers in the country. Because of these other interests, Uncle Mack is not one of those people who have let their work define them, so that when they retire they feel lost and uncomfortable without a job to tether them. I know he wants to work on his golf game (what retiree doesn’t?) and he and Aunt Corinne still have a lot of exploring to do in Savannah, Georgia and its environs. He’ll keep reading, and thinking. I expect that I will get book recommendations from him, as I always have; he was an enthusiastic proponent of Zen and the Art of Motorcycle Maintenance and Watership Down, among many others. Uncle Mack no doubt also will continue to be as open to trying new things as he always has been — whether it is experimenting with woodworking or finally writing that novel that he and I used to talk about when Kish and I lived in Washington, D.C. in the 1980s. You would expect nothing less from a man who made his career dealing in the world of ideas.